OxyPoint is the only Italian company which can offer different rental formulae depending on the specific needs of the patient. They range from pure rental, ideal for travel or trips - to preliminary rental, for those who want to try the machine before they buy. The hire formulae only apply to portable oxygen concentrators, they aren't available for CPAP and other related devices. 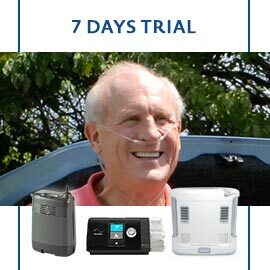 The preliminary rental service is for those who are interested in buying a portable oxygen concentrator, but who want to try it first for 7 days. Few customers want to buy a device worth about 4000.00 Euros without first trying it out. Through this service we'll deliver a brand new concentrator within 24/48 hours, ready to be tested day and night for 1 week. At the end of the rental period you can decide whether to return the device, or, if you want to keep it, then the (already paid) rental price will be discounted from the full purchase price. The pure rental formula is for oxygen therapy patients who need to go on a trip. Warning: if, at the end of the rental period, the patient decides to buy the device, the pure rental rate will NOT be discounted from the purchase amount. The discount of the rental price from the full purchase price is only applicable for the preliminary rental formula.